SMALL KUCING: Big Bad Wolf Books Sale : Mission 63! Great news! I had a great day yesterday. Can you guess? Yup!! 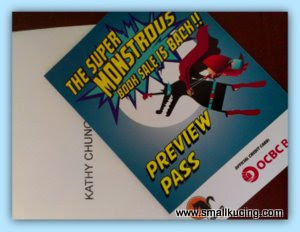 got our most coveted Preview Pass to the BIG BAD WOLF BOOKS SALES! Mamarazzi better lock it the Safe as the Pass is hard to come by. Later I "terconteng" or "terkoyak" , sure I would be skinned alive by Mamarazzi. Guess this year the sale will be super-duper big. Mamarazzi nearly had an heart attack when they announced that " the Sale is opening with a BANG. A 63 HOUR LONG bang!! 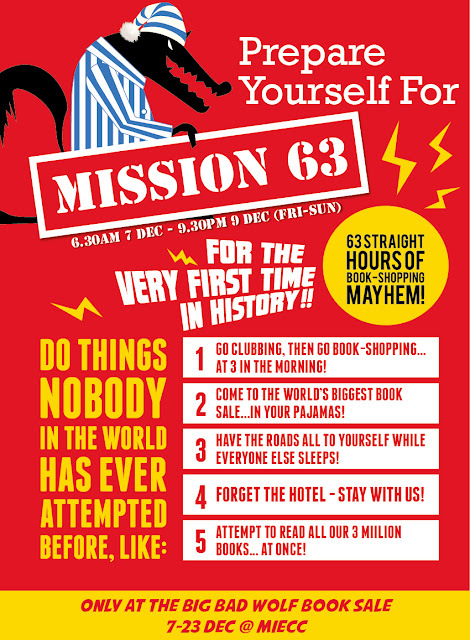 We'll be open for 63 HOURS STRAIGHT - yes, that's right, your eyes aren't playing tricks on you!" Omigosh!!!!!! Can camp there already...Just nice..Friday or Saturday night can go Mines watch midnight show. Then supper at mamak and heads over to the sale. Camp there. After putting the Preview Pass at a safe place, we went gai-gai lor. I went gai-gai to Sunway Pyramid. Wow...the Christmas decorations are up already. Went to a bookshop to get some stationery for me but Mamarazzi spotted this book. 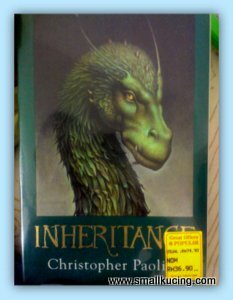 Yup...it's the final book of The Inheritance series. Price finally come down to RM36-90. Still a bit high for Mamarazzi but 'beh tahan' coz she have been waiting for more than a year for the price of this book to come down. I say it would be "padan muka"(serves her right) if next week she happens to chance upon this book at the Big Bad Wolf Books Sale! Gosh...really wondering what book would they have at the Preview. Saw in their websites there were just too many books that Mamarazzi wish to have. The trouble is, whether the stock would be show cased on the day that she goes coz Mamarazzi estimated that they will replenish stock very often and each time new titles will be out. If this email is not displaying correctly, View it in your browser. Tick! Tock! Tick! Tick! SEVEN days to the sale!!! If only I stay in KL, I would surely go..
no need stay KL. outstation readers are also welcomed. in fact , there are some friends coming down from north just for this sale. I hope you get what you want!! Good luck - have fun! Me, same as SWK....zzzzzzzzz!!!!! LOL!!! OMG!!!! How I wish it will happen here also in Kuching. Die la...I'm itching to go the sale but then I still have unread books from last year's sale!!! oh gosh!! I think better camp there... after all, whole night you will not be able to sleep in your own house on the eve... hehehe..
wah, so kan cheong want to camp there to be the first to get into the bookfair?? but i think maybe if you go movie, then go supper then go camp there, probably you don't have any more energy when the shop opens already, haha!! saw in their FB say there got drinks and food wor...should be no problem gua. I don't know how many books you are going to grab this time. Must be a lot. Anyway, enjoy! I can foresee Mamarazzi will drive a truck there. I have been waiting for thise for a whole year! !its HEAVEN. They have manga there?? Wah! You seriously mean Japanese manga? Ya wor. last year they have it. I think this year will hv it too. looks like a very good place to be at, judging from the discounts given.. wow enjoy! Oh my gosh, 63 hours straight of sales of books???! It will burn a super-big hole in my pocket. I'm even considering packing my bags and going down to KL on those days! No it won't coz It's average rm8-drm10 per book only. What a galore with all the books with such great price. I am sure you would have had a great time.